Story: Twenty-five years ago, a young woman and her friends stopped an evil Leprechaun by shoving a four-leaf clover in its mouth and watching its melting body fall into a well in North Dakota. What happened to his pot of gold is anyone’s guess. Today, the property is run by the AU Sorority House of a premiere Eco-science college. A group of students decide to spend their summer vacation turning the house into a perfect “green” living abode. And it would be challenging enough, without the depraved Leprechaun they unwittingly revive. Now he’s back and determined to get his gold by teaching these ladies a lesson in murder. Except, they aren’t having it. The women band together to find his gold and add taking down a misogynistic Leprechaun to their course load. It’s great to report that yes, Leprechaun Returns is “just another dumb leprechaun movie,” but in all of the best ways. It helps that director Steven Kostanski is a fan of the films and wanted to make this one as close to the originals in tone as possible. It really helps that Kostanski is a fine filmmaker on his own, previously gifting horror fans with The Void last year. He knows what he’s doing behind the camera and as a result, Leprechaun Returns may be the most well-made of the entire series. It looks like it has more of a budget, even if it doesn’t. It felt like a director, not a hired gun (as you’d expect form a Syfy original) was behind the camera. It’s also intentionally funny due to a surprisingly clever script. It was really nice to see a slasher lead (played here by Taylor Spreitler) who is not only smart enough to survive but also has a personality to make her likable. I’d argue that none of the previous Leprechaun movies had lead characters worth following, possibly because most people were drawn to Warwick Davis. Spreitler is funny on her own and endearing enough that watching her fight the Leprechaun is a treat. The script is very self-aware, not in the Scream sense but in that it knows it’s a cheesy B-movie and doesn’t really care. You’re not watching this for high art and it’s not trying to provide that. It’s instead giving lame jokes and gory kills. The gore, by the way, is almost entirely practical and that’s definitely welcome. Low budget movies tend to rely heavily on CGI, particularly for blood, and this one choose to go the opposite direction. You’ve got enough green and red blood flying around here to make this appropriate Christmas-season viewing and it’s all real. People are being cut in half, dismembered and torn apart in nearly every kill and it looks good. Even when CG is clearly used, it only really looks bad in one instance near the end. The star of the show would be Linden Porco, who steps into Davis’ buckled shoes to play the titular monster. It’s one thing to have someone else play the leprechaun when it’s a film barely related to the main franchise at all, such as Dylan Postl in Leprechaun Origins. 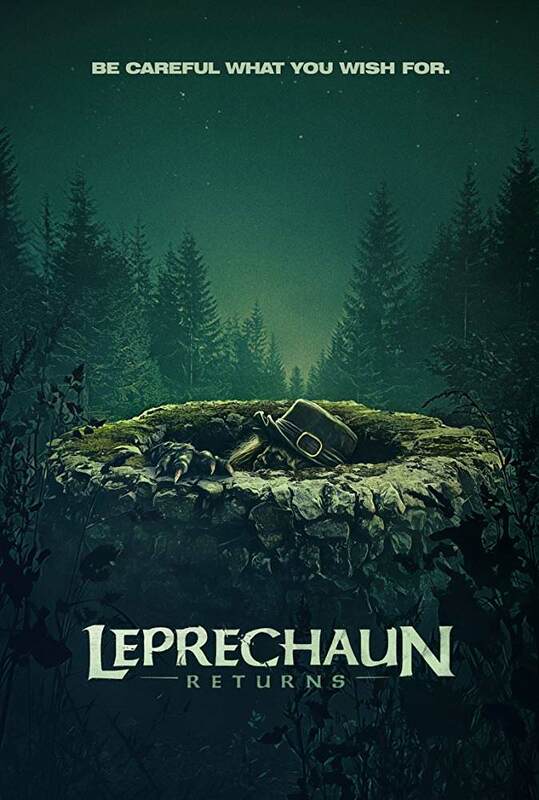 It’s another thing entirely for this movie, which is a direct sequel to the first film and features the Leprechaun that fans of this series love. Porco manages to walk a fine line here, evoking enough of Davis’ previous performance to get the character right but making sure to put his own stamp on it as well. If we have to have someone else playing the Leprechaun, Porco is the guy to do it. That’s not to say Leprechaun Returns isn’t without its faults. As mentioned, there are some CGI effects here and there that look awful due to the budget. There are also some really, really thin characters that are perhaps too dumb, even for a movie like this. I also wasn’t a fan of the relative lack of Mark Holton, whose lovable oaf Ozzie isn’t on screen for as long as you’d like. He also doesn’t talk as much as he did before, for reasons that I won’t spoil. It also seems like they ignored the fact that Ozzie was “slow” in the original, but that was forgivable. Of course, the jokes themselves are also hit or miss, but if anything that’s true to form for this series. Bad puns are the Leprechaun’s MO as much as wanting gold or shining shoes. Is Leprechaun Returns the next great horror film? Obviously not, but you’d be stupid for expecting it to be. Instead it’s a funny, enjoyable gory romp that doesn’t wear out its welcome and is right at home among the best of the series. Basically, if you’re a fan of these movies, you’re going to love this one. If you’re not, then it’s more of the same and you should avoid it. Hopefully a sequel happens sooner rather than later. Leprechaun Returns was way more enjoyable than it had any right to be, and easily the best-made film in the entire franchise. It benefits from having a great director like Steven Kostanski, who seems to be doing this because he loves the series as opposed to being a hired gun. The cast seem like they were enjoying themselves, the script is very self-aware and there's enough practical blood and guts to keep anyone happy if they want some dumb fun.